Wander across the field from the beautiful upper reaches of the River Fal through the delightful landscape of this part of the Roseland Peninsula and you will find a wonderful retreat at Ardevora Mill. Located just outside the historic village of Philleigh, down a long farm track, this is the perfect place for those looking for peace & tranquility! Despite its rural location, Ardevora Mill is only a 10 minute drive to the nearest beaches at Pendower and Porthcurnick. Both of the villages of St Mawes & Portscatho with their shops, restaurants and art galleries are also within easy reach. Crowjy Ardevora is one of three self catering cottages at Ardevora Mill. This single-storey barn has been carefully converted, retaining many original features. With high ceilings, original beams and very comfortable furnishings the owners have created a superb hideaway. Crowjy adjoins the next property, Ardevora an Gylen, which can be combined (by way of an internal interconnection door) to provide accommodation for up to 9 people. For larger parties Ardevora Vean (next door, Friday changeover) sleeps a further 2 persons. You will be warmly welcomed to Ardevora by the owners, Andrew & Teri, who really go out of their way to make you feel totally at home in this very special place. Ground Floor: The cottage is on the ground floor, however there are a couple of steps within the property. Via the spacious hallway, enter the lovely open plan lounge, take 2 steps up to the dining & well equipped kitchen. A door from the dining area leads to the large patio & garden that has superb countryside views. The comfortable double bedroom has a king size bed and plenty of wardrobe and drawer space. There is a further triple family bedroom with 3 single beds and again plenty of space. The 'wet style' shower room also has a WC and wash hand basin, with non slip tiled flooring. Exterior: To the rear the enclosed large patio & grassed garden (shared with Ardevora an Gylen) has ample patio furniture and wonderful countryside views. Alongside the cottages there is a separate, shared laundry room with washing machine and tumble dryer. BBQ are also available. Heating is via oil fire under floor heating & electricity. The kitchen is well equipped with a fridge & freezer, microwave, kettle, toaster, dishwasher, electric oven & ceramic hob. The lounge area has a TV with Freeview & DVD player. WiFi is available at the property. There is an iron and ironing board. Electricity, heating, bed linen & towels are all included, but you will need to provide your own beach towels. There is parking available for a number of cars on the private driveway. Although the owners have their own dog, we regret that guest's dogs are not permitted. Regrettably no smoking is allowed. For those younger guests a cot & high chair is available on request. For a nominal fee you can hire the owner's kayaks to explore the river at your leisure. Arrival/Departure is normally a Sunday. &pound;100 security deposit pre-authorised on your card is required. Discounts available for couples staying for 7 nights outside the peak season (using one bedroom only). Excellent accommodation. Very friendly and helpful host. We all enjoyed use of kayaks. Lots of info about local area provided. Would visit again. Thanks for your kind comments and good rating. We hope you do visit again. We booked this holiday at short notice and as a family we wanted to say that it more than fulfilled our expectations. It was very relaxing in a peaceful, beautiful part of the world, and whilst the long driveway meant we felt nicely secluded, at the same time there was easy access to the Roseland peninsula and to other parts of Cornwall via the King Harry ferry. The facilities in the cottage were excellent & we felt the service provided by Teri & Andrew was excellent & struck the right balance: on hand when needed and discreet at the same time. The provision of the kayaks to use on the nearby Fal river was a real bonus. In conclusion, would thoroughly recommend this cottage! Hi there, thanks for your wonderful recommendation and perfect 5* rating - we do appreciate it. It was lovely to meet you and your family and hope that you will return in the future. stay at the cottage much more pleasant. Nothing more to say than the accommodation is excellent in every respect, the position tranquil and inspiring settled at the heart of Cornwall's beautiful Roseland peninsula. Thanks very much Neil for this amazing review. It was a pleasure having you and the other painters to stay. I would not hesitate to recommend you too to other holiday cottage owners. Barn style, one of three in the complex. This is certainly the place to base yourself for a peaceful week of fresh air and tranquillity. We thought a hot tub or swimming pool would be great asset as this is a bit off the beaten track. The tiny tranquil Cornish village of Philleigh is in superb countryside in the heart of the rural Roseland Peninsula, Cornwall. Famous for its sixteenth century pub, The Roseland Inn. 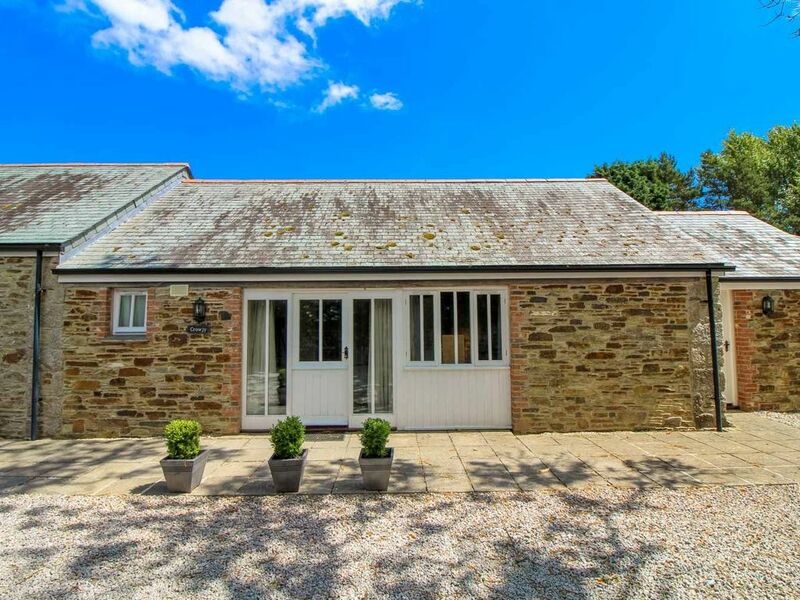 Philleigh is ideally located for exploring the countryside of the Roseland Peninsula whilst only a ten minute drive from the superb beaches around Portscatho & Carne. The D-Day embarkation points at Turnaware Point and Smugglers Cottage are only a short drive from Philleigh. The nearest pubs are the Roseland Inn at Philleigh, the Kings Arm in Tregony and the Kings Head at Ruan Lanihorne, all of which serve excellent food. There are shops, restaurants and local facilities in Portscatho & St Mawes. Bed linen, towels, electricity & heating are all included. Discounts available for couples staying for 7 nights outside the peak season using just one room.